This colorful salad can be either a great side dish for a main course, although the addition of goat’s cheese makes this salad a perfect wholesome, standalone meal, too. I love it after exercising at the gym: it is light and nutritious. 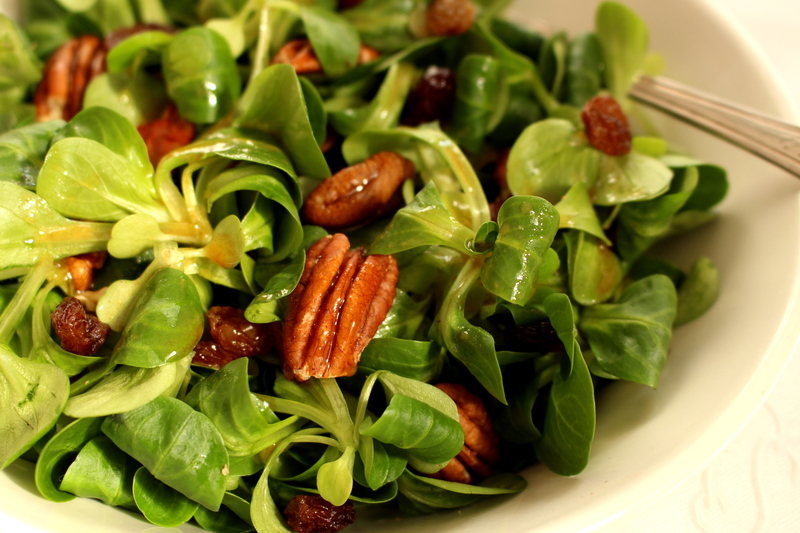 The color of nuts and raisins contrast with the bright green of the lettuce and add an exotic flavor to this dish. The dressing , sweet and spicy, is prepared with extra virgin olive oil, balsamic vinegar, honey and mustard. This mix of flavors goes very well with the taste of songino lettuce. Songino also known as lamb’s lettuce, has a slight sweetish taste and numerous nutritional properties and health benefits. It is rich in vitamins (A, B and C ) and minerals (phosphorus , potassium, iron and magnesium). It also has diuretic and detox properties, so it is a great choice for cleaning out our bodies in preparation of the summer. Do not forget that nuts are very rich in vitamins (especially vitamin E), minerals and unsaturated fatty acids, therefore an healthy choice too! 3. In a large bowl toss the lettuce, walnuts and raisins (keeping aside a tablespoon of each of these ingredients for garnish) with the dressing. Serve immediately. You can garnish with goat cheese cut into small pieces. This colorful and nutritious salad is a real treat for the eyes and for the palate, something I usually prepare in winter when clementines are juicy and delicious in Italy. The addition of toasted pine nuts give a crunchy, sweet and nutty flavor to this fresh dish. The dressing is prepared with lime that adds a further note of freshness. This salad can be a great side dish for grilled meat (tagliata) while the addition of goat cheese makes this recipe a perfect dish for a light and nutritious lunch. The avocado is a fruit that was not used in the past in our Mediterranean diet originally from Mexico, but nowadays it is getting more popular because it is tasty and is beneficial to one’s health and beauty. Hemingway called it ” food that has no rival among the fruits, the real fruit of paradise.” It is rich in vitamin A and E (which have high antioxidant properties ), minerals and fatty acids, and it provides a lot of energy. It is a “panacea” for health, and we should not forget that is also an aphrodisiac! 6. 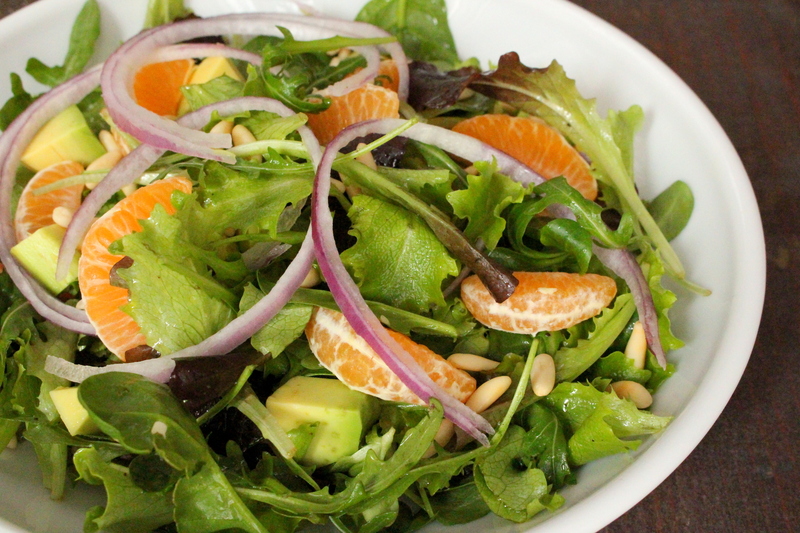 In a large bowl, toss the salad with the dressing and garnish with avocado , clementines, onion and pine nuts. Serve immediately. 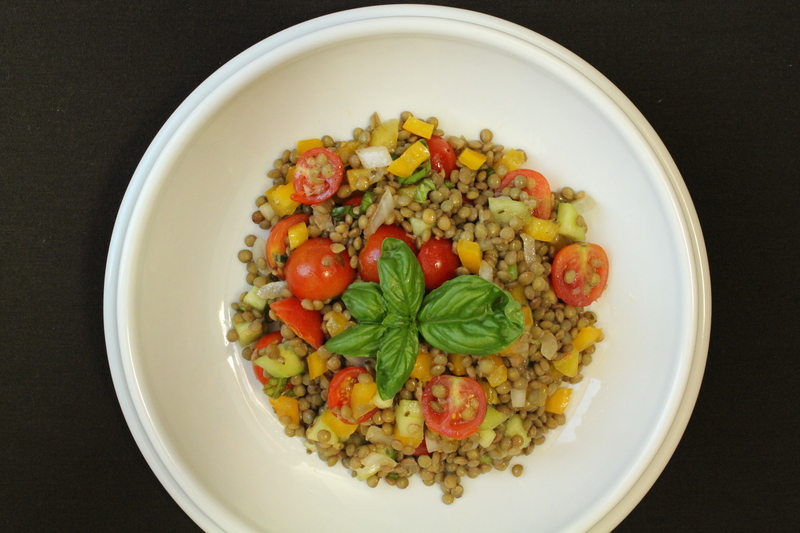 This lentil salad with fresh vegetables is a refreshing, summertime dish that you can enjoy either as a main course accompanied by cheese, or served as a side dish. This is a recipe you can prepare in advance and stored in the refrigerator for 12-24 hours. It is quick and easy, in fact, it is not necessary to soak the lentils for several hours before cooking them. It is best served fresh, “just made”, at room temperature, but you can also refrigerate it and enjoy it cold the next day. Surely this salad is healthy and nutritious. Lentils, in fact, like all legumes, are an important nutritional source of proteins and carbohydrates (in the past they were known as “la carne dei poveri” the meat of poor people), but they are also low in fat. They are also rich in iron, potassium, phosphorus and dietary fiber which are important to keep your cholesterol levels in check. Lentils are ancient legumes, consumed by the Egyptians and present in different quotations from the Bible. In the past, they were peasants’ food because of the high nutritional value and low cost. These tasty and versatile legumes, often found in vegetarian cuisine, are good in salads, soups and other recipes. Do not forget that lentils are a symbol of luck and wealth, therefore let’s eat them in abundance! 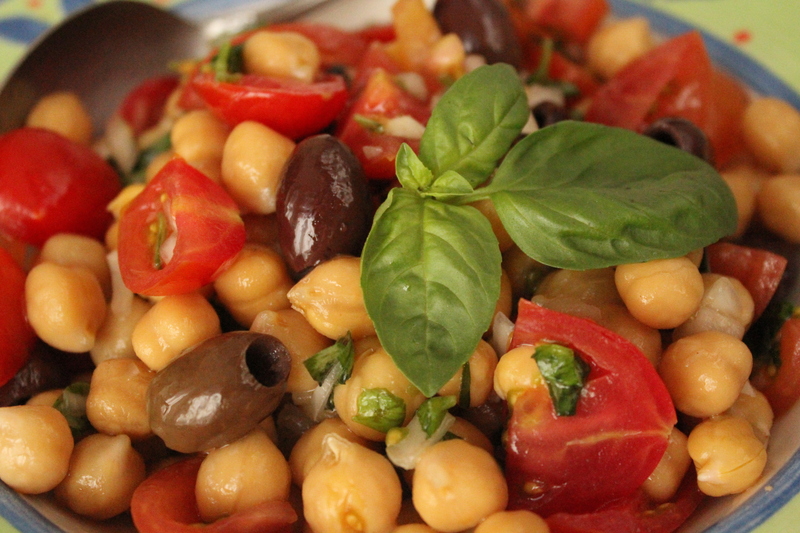 This is refreshing and healthy salad made with chickpeas, olives, tomatoes and onions, flavored with olive oil and fresh basil making this salad even more delicious. This is a perfect vegetarian dish for a light summer lunch and is best served fresh “just made” and at room temperature to heighten the flavor of tomatoes and basil, although you can also refrigerate it and eat the next day. Chickpeas – or garbanzo beans – are legumes rich in protein, zinc, B vitamins, folate and fiber, but also low in fat and most of which is polyunsaturated: good friends for your heart!!! They are one of the earliest cultivated legumes: 7,500 year-old remains have been found in the Middle East. They are largely cultivated in the Mediterranean area and are well known in Italian cuisine. The Mediterranean chickpeas have lighter color, larger seed and smoother coat in comparison to Asian ones. I love their buttery taste, like a combination of chestnuts and beans, and I enjoy them in everything: salads, stews, pasta (the delicious pasta e ceci), in fritters and farinata. You should start the day before you plan to serve the salad. 1.Rinse the beans under running water, then place in a large glass bowl with bay leaf. Fill bowl with plenty of water to cover generously (about 5 cm, 2 inches above the level of the chickpeas). Cover with a lid and soak overnight. 6. Season with salt and pepper to taste. Let the salad rest for 10-15 minutes and serve at room temperature. 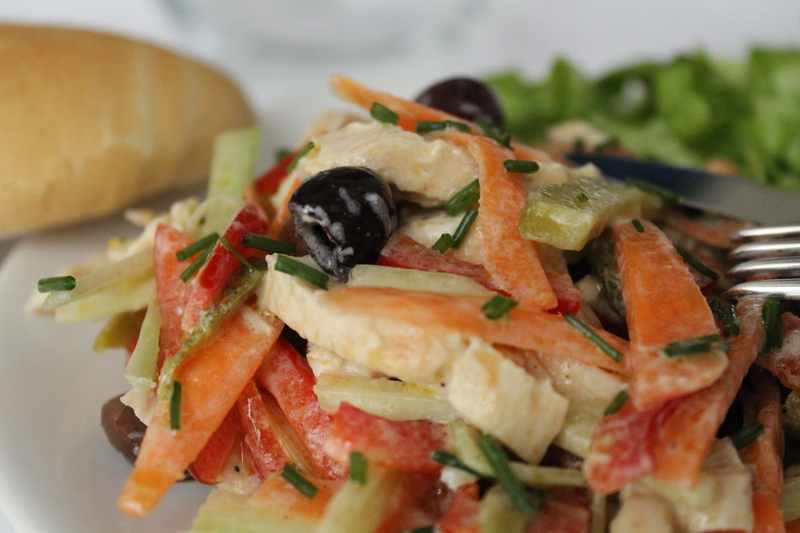 How about a refreshing summer salad made with grilled chicken breast, carrots, red pepper, celery, pickles and delicious Taggiasche olives? The dressing is prepared with Greek yogurt, mayonnaise and flavored extra virgin olive oil. The addition of olive oil lends a special taste to this salad, a Mediterranean touch. Chicken is a healthy choice, in fact it contains less fat than beef or pork, and it is rich in vitamins and minerals; it is therefore is an excellent choice for a light and nutritious diet . In addition its milder taste complements a lot of dishes. This salad may be served on top of lettuce, tomatoes (or the combination of them) or in a sandwich, and it is an easy dish to take on a summer picnic. Try it cold or at room temperature, as an appetizer or main course. 5. Cover with plastic wrap and refrigerate for at least 30 minutes. Serve cold or at room temperature. The fresh vegetables make this salad a perfect and colorful dish to celebrate the flavors of spring. Farro is an ancient grain, a variety of wheat called emmer. It was used by the Etruscans, Egyptians and the Romans. Nowadays it is cultivated especially in northern Tuscany, in the province of Lucca. Farro has a delicious nutty and earthy texture that makes it a wonderful choice for entrees, soups, side dishes and salads. It is a versatile ingredient, as well as being highly nutritious. Farro is rich in proteins, dietary fibers and magnesium; it is a good source of vitamin A, C, E and vitamin B complex, and it is low in fat. It has a very low glycemic index, making it also suitable for diabetics. I use farro perlato (pearled farro, from which a portion of the outer bran has been removed) instead of whole farro for my recipes, because it cooks faster and does not requiring soaking. In fact, farro perlato cooks in only 20 minutes. This is a quick, easy and tasty recipe to prepare, something you can eat either warm or cold. 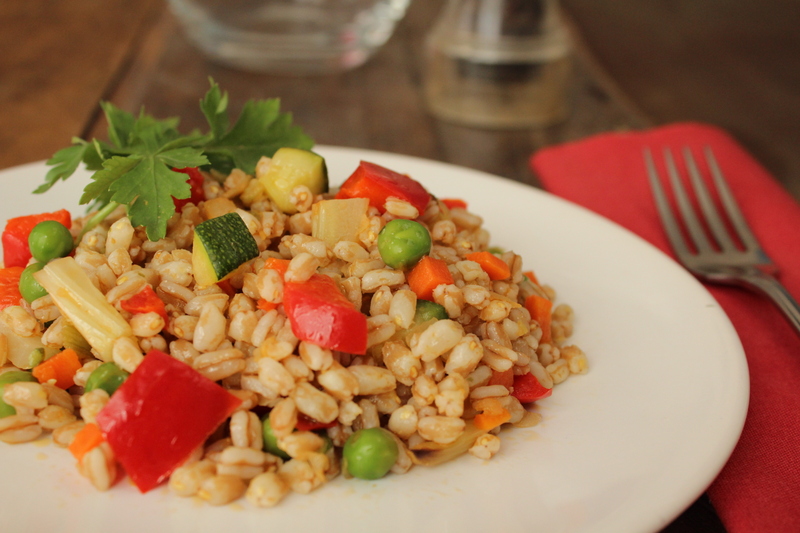 The sautéed and sweetly flavored vegetables combined with the nutty farro make an irresistible vegetarian dish. 5. Add the fennel and zucchini, cook for 5 minutes. At this point add the peas and cook for additional 3-4 minutes stirring a few times to prevent burning. The cooking time for the vegetables can vary according to your taste: crispy versus soft and well cooked. I go for crispy! 6. After 20 minutes drain the farro and add it to the vegetables. Toss to mix all the ingredients well! Add salt and pepper to taste. You can serve it either warm or cold. Decorate with parsley, basil or mint. Octopus and potato salad, a refreshing and light dish that reveals the exquisite taste of the octopus. It is a Mediterranean delight to enjoy either as an appetizer or a main course, served either warm or cold and accompanied by a glass of dry white wine. 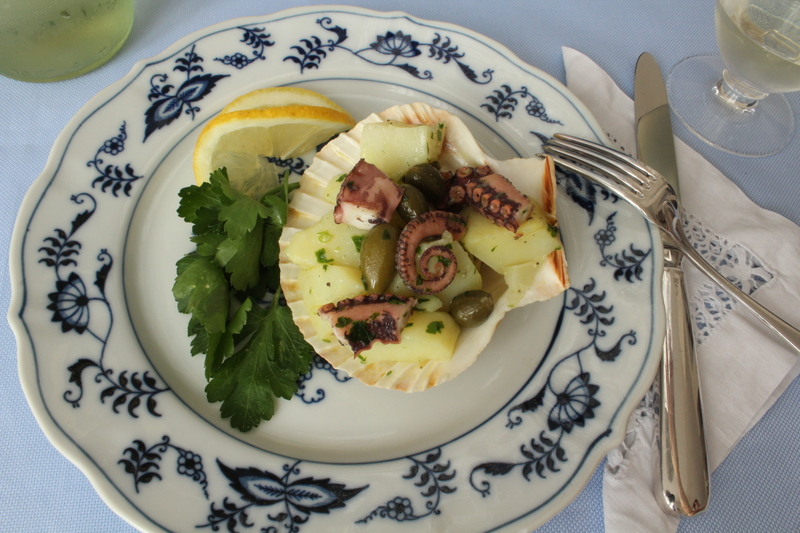 The simple dressing made with olive oil and lemon juice brings out the flavor of the octopus and the potatoes. This is a lovely way to eat octopus, a low-calorie and lean seafood, and is an ideal way to get protein, minerals (especially iron), vitamins and antioxidants, without taking in too much fat. The name of octopus derives from Greek, octo eight and pous piede, with eight feet. Octopus is delightful, but it can be tricky to cook it, with possible results ranging from soft and tender to tough and rubbery. The cooking time is critical for the best results, and I would recommend tenderizing it with a meat hammer (see note) before cooking. 6. In a large bowl combine the octopus, the potatoes and the capers and season with the dressing. Place it on a serving plate or in a shell. You can either serve it warm or cold. You can, alternatively, also set the potatoes on a serving dish and place the octopus in the center, then add the dressing on top. 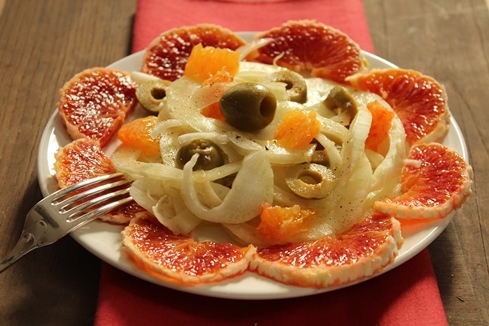 This year’s citrus season is almost over, but we still have time to enjoy this delicious Sicilian salad made with fennel bulb, blood orange and olives. This is a simple and refreshing dish, perfect to serve either for a light lunch or as a side dish with dinner. The sweet and beautifully colored blood oranges complement the delicate anise taste of fennel, while the addition of olives makes this recipe a symphony of flavors for your palate. The brilliant red flesh color of Sicilian blood oranges is due to an antioxidant compound which – although found in many fruits but uncommon to citrus fruit – makes this citrus very special! Fennel is indigenous to the Mediterranean area, but it is now widely cultivated in many other parts of world as well. The fennel bulb, foliage and the seed are used in various culinary traditions and medicinal purposes. Fennel is very refreshing, purifying and diuretic. The bulb is a crisp vegetable that can be used in many ways: sautéed, braised, grilled, stewed, au gratin or just eaten raw in salads, seasoned with extra virgin olive oil and lemon juice. This salad is not only very beautiful, but it is also delightful and healthy. It is rich in vitamin C, antioxidants and nutrients, and it helps keep you healthy too! 6. Arrange the sliced orange on a serving plate. Place the salad mix in the middle and decorate with the whole olives. Serve immediately.